Starting 9-9.30AM at kondapur Toyota showroom as planned to go to Narsapur reserve forest, Initially we had to pause many times for fuel filling of car and bike as well as our stomachs since it was forest area we knew there were no hotels. 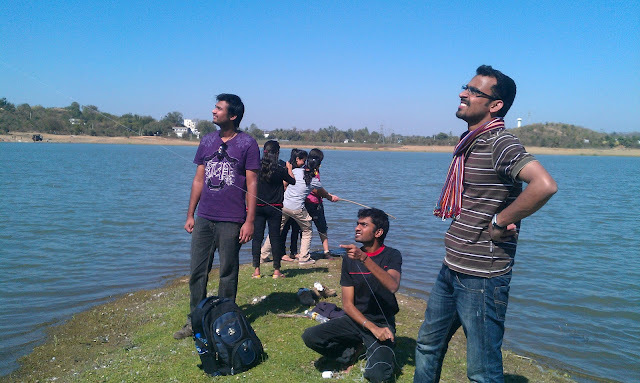 My safar started in the bike with a friend and bunch of friends in car, we took some kites on the way so that we could have a nice time pass in the banks of lake! !since it was Makar Shakranti we would find many kites available on streets. We reached around 11AM and were ready to trek through these unchartered forests. We started off at a small Ayyapa Swamy temple 2kms before Narsapur, and entered the bayanak jungle so called!! Definitely not searching for Naïve Bird (Naadan Parindhey)hehhehehe!! We were so gripped in admiring the lush green and we could see several stream paths which had now dried out and may lead to many ways. This being January, it had not rained in quite some time. But I think it would be a great place to trek in the monsoon times. 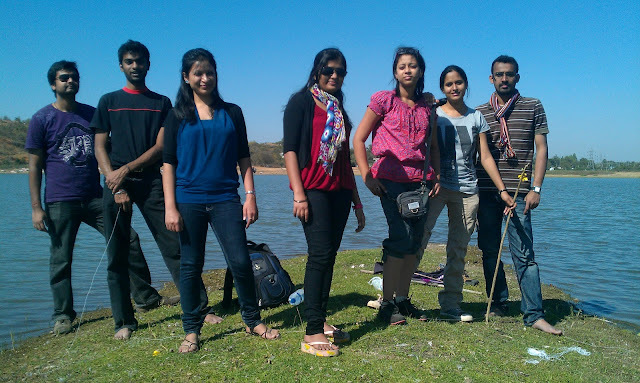 It was very good that we found lake with water!!!! Reminded me about my childhood after flying kites. There's an old saying in China - "Those who fly a kite can have a long life." But It’s India. After compromising the lunch with biscuits as well as readymade juices, decided to turn back soon because it was very sunny. It’s very easy to come back as well; there is no need any sophisticated weapons such as compass and GPRS, use your common sense that’s more than enough. We started back to kondapur where we started our journey in the morning and had Pizza at Pizza Hut. Planned to go to Golconda fort next day. 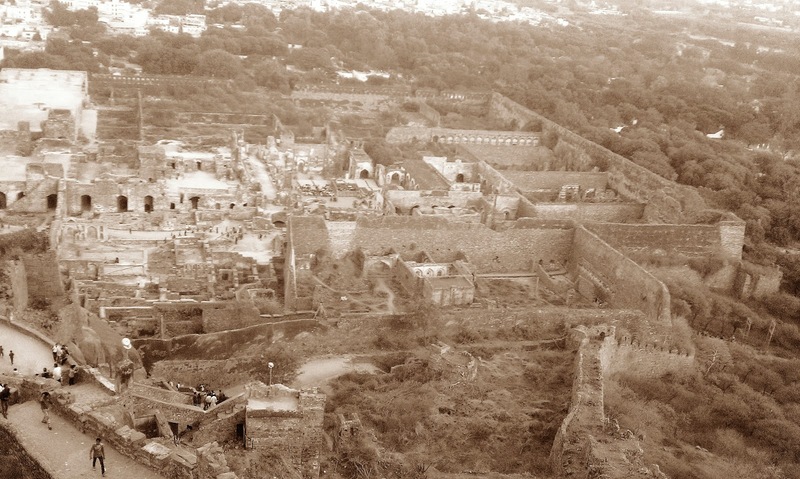 It was not the first time I visited Golconda fort because earlier I visited last year with friends. "Golconda" (Golla means shepered and Konda means Hill, thus Shepherd's Hill), Early mornings would really have been ideal for the walk and the views. We went to fort in the late afternoon, little tired because it was hot and hotter because of rocks. The entrance gate Balahissar shows the construction beauty without studying engineering. Just after this beautiful entrance, there is one particular square built on floor standing on which if you clap, the vibration generated through that propagates towards the top of the fort several feet away. I think it was used to communicate and also may be used for cautioning! !Interestingly if you clap away from that square the vibration is not generated. It will take 2-3 hrs to look around the fort. Ruins of fort will be in our eyesight. Feels that secularism existed in good old times because inside the fort there was a Hanuman temple!!. Laser shows in the evening opens our childhood memories of social science in schools which was boring as usual history repeats. Way back heading back to room. A must watch if people happened to come to Hyderabad “The Pearl city”. I feel like sharing some of memories of last year, visit to Hyderabad without which I am not making justice, its none other than "The Arc de triomphe of the East" and also Salar Jung Museum!!. A magnificent piece of Islamic architecture standing in the heart of the city built by Quli Qutub Shah, in 1591. The Landmark monument is the unique symbol of Hyderabad.This beautiful structure derives its name from four intricately carved minarets, The four graceful minarets literally meaning 'Four Minars', soar to a height of 48.7m each, above the ground.The colourful trditional chudiyaan shops as well as pearl shops makes the surrounding more scintillating. 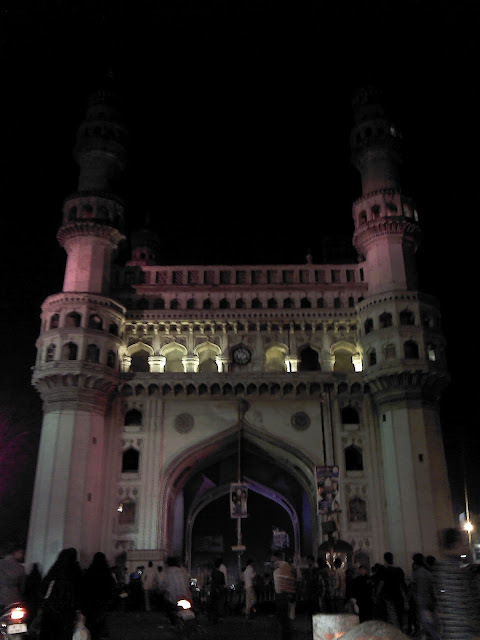 Charminar depicts the symbiosis of hindu and muslim traditions.